Many of us take our vast country’s beauty and culture for granted. When it’s time for a vacation, we often think about travelling to other parts of the world, and yet our home and native land has so much to offer and to see. 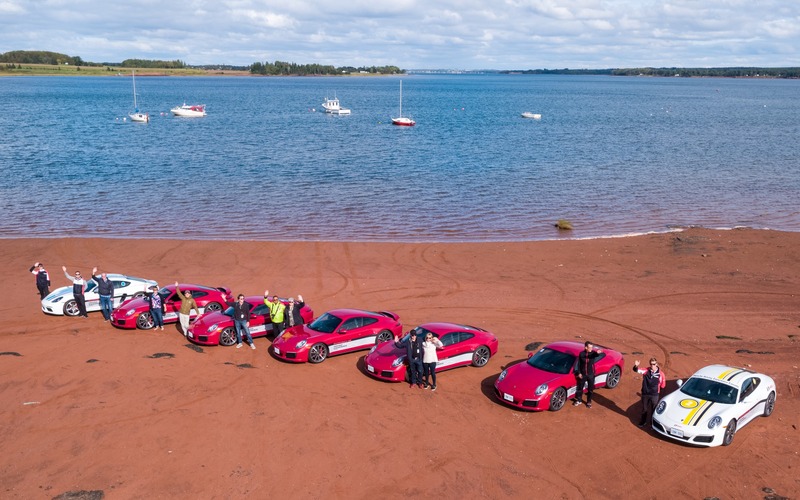 As it celebrates the 150th anniversary of its confederation, Porsche decided to set up a tour of Canada. 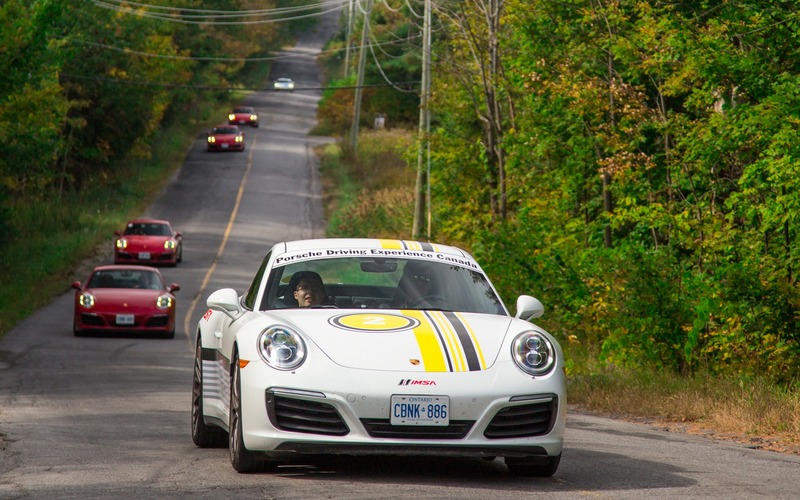 This tour, which was open to Canadians, but also to Porsche enthusiasts across the planet, consisted of driving a total of 2960 kilometres from Ontario to Nova Scotia. Participants visited most major cities along the way, soak in the local culture, eat fantastic food and lodge in fancy hotels. Oh, and if that wasn’t enough, the trip would be enjoyed aboard a 2017 Porsche 911 Carrera 4S. Not a bad ride for the drive, eh? Porsche Cars Canada invited a handful of journalists to tag along with their participants, a wonderful bunch of people that ended up making the trip even more enjoyable. There was Sunny, who recently moved from China to Seattle with his family. He owns a BMW X5, but should soon be buying a sports car. There was JoAnn, from Ontario, who owns both a Porsche Boxster S and a Macan. Paz and Lisa were from Winnipeg, and back home, they drive a Porsche 911 Turbo S. Last but not least, Mike and Sue, who came all the way from Perth, Australia, owners a 911 Turbo. They were all intrigued by this event, as discovering Canada always ends up being an amazing trip. However, these folks all have something in common, and that’s a love for fast cars, and a love for Porsches. The ten-day trip started in Toronto and ended in Halifax, with stops in Kingston, Ottawa, Montreal, Quebec City, Edmundston, Saint Andrews, Charlottetown and Cape Breton Island. Yours truly followed the merry bunch from Ottawa to Quebec City. Each day included between 280 and 500 kilometres of driving as well as organised activities such as a cruise or guided tours through the cities and towns. The first few days of motoring were likely the least thrilling, especially leaving downtown Montreal in morning rush-hour traffic, where trying to keep a six-car convoy together is impossible. However, once the group escaped the dense traffic of the major cities, the colourful fall backdrop and the roads towards Cabot Trail probably just got better and better. Finding a more suitable sports car for the trip would’ve been difficult. The 911 Carrera 4S boasts a twin-turbo, 3.0-litre flat-six engine that belts out 420 horsepower and 368 pound-feet of torque. Equipped with the optional seven-speed PDK automatic gearbox and the Sport Chrono package, the car can blast from 0 to 100 km/h in as little as 3.8 seconds. Keep pushing the 4S and it can top out at 303 km/h. We didn’t try that. The 911 is also a sharp road scalpel, but when the Comfort drive mode is selected, the ride isn’t nearly as punishing as one would expect. It’s a wonderful grand touring coupe, or Targa, or cabriolet if that’s what you prefer. There currently are 22 different versions of the Porsche 911 available on the Canadian market, ranging from the $104,000 Carrera coupe to the outrageous, $334,000 911 GT2 RS. The 911 Carrera 4S coupes we drove each cost about $140K before delivery charges and taxes, although I’m probably forgetting a few grand worth of options. There are a lot of options. Actually, the only downside to the 911 for the Porsche Tour Canada 150 was the lack of cargo space, obviously. The front trunk has a capacity of 125 litres, and my carry-on suitcase easily fit under a couple of soft bags, but the participants’ full-size suitcases had to be hauled in the back of a Cayenne. A minor detail, really. Complaints? Yeah, there were some. However, when you pay $12,000 plus taxes per person to embark on this trip, you’re entitled to your opinion. The biggest issue participants had with the tour was that there wasn’t enough driving time, and not enough opportunities to fully exploit the 911’s potential. 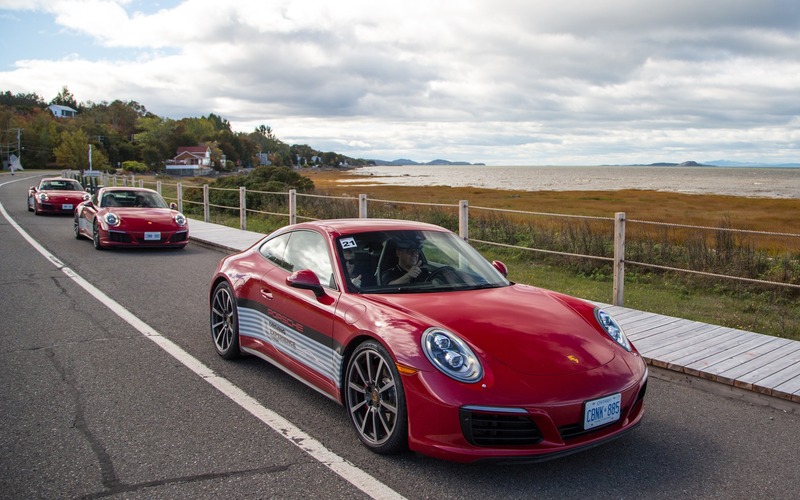 Truthfully, it was more of a scenic tour compared to what the company usually organises, such as the Porsche Sport Driving School courses, the Porsche Performance Tour events and Porsche Camp4 winter driving. In those, it’s all about driving, not sightseeing. Why are these programs so popular? Why pay so much money to spend a few days with people you’ve never met before? Why not spend vacation money on an all-inclusive, beach and booze trip to the Caribbean? For the Porsche experience, that’s why. It may be hard to grasp for most of us, but after spending two days on the Porsche Tour Canada 150, after listening to the stories around the dinner table and seeing Sunny, JoAnn, Paz, Lisa, Mike and Sue smile and laugh as they share a part of their lives, it became clear as to why people sign in and participate. As mentioned earlier, they all have one thing in common, and that’s the love of the Porsche brand and the ownership experience. Premium automakers not only sell vehicles, but a lifestyle and the feeling that you’re part of a club. That’s what brought this group together, and after spending 10 days with each other, they’ll probably keep in touch for the rest of their lives. You can’t put a price on that.